Mr Wali Shukoor is a barrister at 11th Floor, Garfield Barwick Chambers who we regularly brief to represent clients in a range of courts – from the Local Court, to the District and Supreme Court of NSW. Before being called to the Bar, he worked exclusively in criminal defence firms for several years, including as the Managing Senior Lawyer for a leading Sydney criminal law firm. 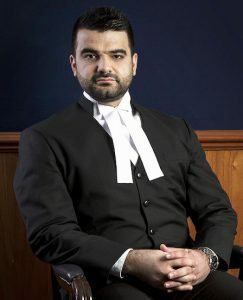 Mr Shukoor is often briefed in complex District Court sentencing hearings, all grounds appeals and trials, and bail applications in the Supreme Court. He is also available for complex defended hearings in the Local Court and severity appeals in the District Court. He is a meticulous and persuasive barrister who regularly produces exceptional outcomes for our clients.